When using paper charts, the need to plot positions at regular intervals keeps the navigator actively involved with monitoring the progress of the voyage. He is required to frequently look at the chart and will quickly detect if the vessel is being set off the course towards danger. He will also be looking ahead to the next waypoint and be noting any dangers close to the track. With ECDIS there is the risk of losing this high level of situational awareness as the navigator’s role becomes increasingly passive. A quick glance at the ECDIS may be considered enough to note the vessel’s position and whether or not the vessel is on the courseline, but this is not sufficient to ensure the safety of the vessel, to confirm the integrity of the automated position fixing or to maintain awareness of hazards ahead. It is therefore essential that navigators maintain an active role and continueto manually plot positions at regular intervals to confirm the positiondisplayed on the ECDIS is correct. There have been cases of vessels running aground because the navigator did not notice that GPS positioning had been lost, and the ECDIS was running in DeadReckoningmode. A warning message should appear on the display when DR positioning is being used. important safety information may not be visible the OOW does not know how to access additional useful information. As with all electronic equipment, ECDIS is an aid to navigation. It is not a substitute for maintaining a proper lookout or confirming the ship’s position by all available means.It is important that traditional navigation skills continue to be used. There is a danger that some navigation officers will increasingly trust what is displayed on the screen without question and be lulled into a false sense of security. Each vessel which operates with ECDIS as its primary means of navigation (i.e. paperless) must compile a risk assessment for this mode of operation with appropriate controls implemented. A recent software update on the ECDIS has revealed a change in the way isolated dangers are indicated. In the previous version, isolated dangers of depths lesser than the user defined safety depths, would only show in depth areas greater than the safety contour. 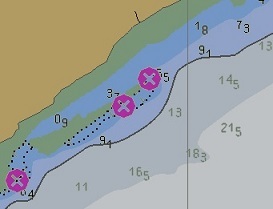 In the new version, isolated dangers of depths lesser than the user defined safety depth are indicated in all areas regardless of safety contour. Additionally, the option to display soundings only in areas less than the safety contour has been removed and replaced by an option to show either all soundings or none. In common with many other ECDIS, the earlier version of this particular system only displayed 2) when the mariner opted to switch them on, as part of the 'All' display or an extended 'Standard' display mode. In the new version, it appears that the manufacturer has chosen to combine 1) and 2) in the default standard display. This does have the advantage of simplifying the system and ensuring that the mariner is always able to see all the hazards, although this may well be at the expense of some additional screen clutter. If navigating through areas inside the displayed safety contour, it is essential to display all soundings as well, as isolated dangers to get a complete picture of the possible hazards. Although many vessels have fitted Electronic Chart Display and Information Systems (ECDIS) on a voluntary basis, its use will significantly increase once passenger vessels, tankers and dry cargo ships begin to comply with mandatory SOLAS requirements for ECDIS. As per IMO performance standards, the equipment should include a function, where the user can select a safety contour from the depth contours available on the Electronic Navigation Chart (ENC). A 4,000 GT general cargo ship adjusted its ETA to arrive at the pilot station earlier than planned in order to meet a high tide. The vessel subsequently grounded on a sandbank. 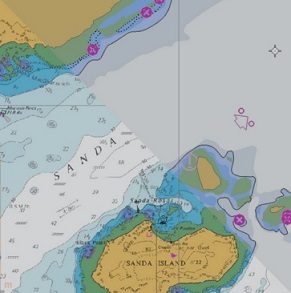 The passage plan was amended when the ECDIS was displaying the ENC at a scale of 1:100,000. Visual inspection of the route on the ECDIS showed it to be clear at this scale. The fact that the vessel would pass a starboard hand lateral buoy on the port side whilst following the direction of buoyagewas not investigated further. Had this been checked, it would have been evident that the amended passage plan took the vessel over a sandbank with charted depths considerably less than the vessel's draft. However this was not obvious to the deck officer who amended the passage plan, or to the bridge officer on watch at the time of the grounding. The safety contour function on the vessel's ECDIS was fitted with a watch vector function whereby a time and angle for the predicted movement of the vessel needed to be set in order to trigger the safety contour alarm. Although the safety contour had been set at 30m, the alarm did not function as the watch vector had not been activated by the bridge team. It was found that the Master and deck officers had received no formal ECDIS training. They failed to recognise the significance of the safety contour and did not know how to set a watch vector ahead of the vessel. They were also unaware of the need to check the ECDIS for violations of user defined limiting parameters (such as the safety contour) when adjusting the passage plan. Drills and On Board Practical Failures : Masters are to conduct a risk assessment and develop a Safety Critical Operations Checklist for coping with ECDIS failures and operating in alternate modes. Drills are to be conducted at least monthly, by each watchkeeper, to ensure familiarity with procedures, and operation in secondary modes. Every OOW must understand how to maintain an up-to-date chart outfit for their particular vessel. Be aware of how your update and support services are provided, e.g. via update CD or Weekly download. Where applicable, ensure that permit discs and update discs refer to the same week. The Second Officer may remain responsible for chart updates, but you must be aware of the procedures. Information required for management of T&Ps are types of ECDIS, software editions that support Admiralty Information Overlay (AIO) and how to insert T&P as Mariner’s Objects. Not all ECDIS types and software editions support AIO, therefore seafarers must know how to insert T&P manually into ECDIS.